Oppo keeps launching new devices every month, and we have seen that the company focuses on keeping the camera game strong by offering good cameras on its phones (especially the front-cameras). 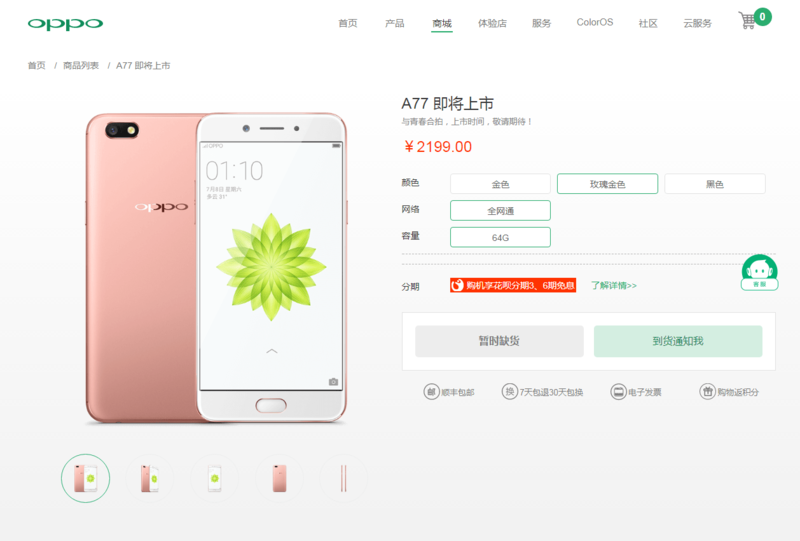 The Oppo A77 was launched in May this year in countries like Taiwan and Malasia, but a newer variant of this device is soon coming to China as revealed by the official website itself. Oppo certainly confirmed on the official website that it would soon launch Oppo A77 in China. It was previously rumored, that the Chinese version will differ from the Taiwanese version in some things, and it seems that these rumors were true. The Chinese version is different from the Taiwanese version as it comes with a better processor (Snapdragon 625, instead of MediaTek MT6750T), and a newer operating system (Android 7.1.1 with ColorOS 3.1, instead of Android 6.0.1 with ColorOS 3.0). And yes, don’t forget that the design from the rear is also absolutely different from the Taiwanese variant. It looks like the Oppo R11 from the back except for the fact that it doesn’t have dual cameras. The device will cost 2,199 Yuan or $325. The company has not yet announced when the device will be launched in China, but apparently, we will not wait long until we know the launch date.